Night of Noise is an event following the Day of Silence. Join us and break the silence. The purpose is to discuss bullying and silencing of LGBTQ+ youth in schools. This youth oriented event will provide free food, a workshop, a march, local LGBTQ+ speakers, and drag performances. As part of our workshop, we will be providing food. Vegetarian, vegan, and gluten free options. The march will start at the Boulder Pride House and head along the Pearl Street Mall, up to Casey Middle School. A variety of prominent members of the LGBTQ+ will be speaking and sharing their experiences. 1301 High St, Boulder, CO 80304. 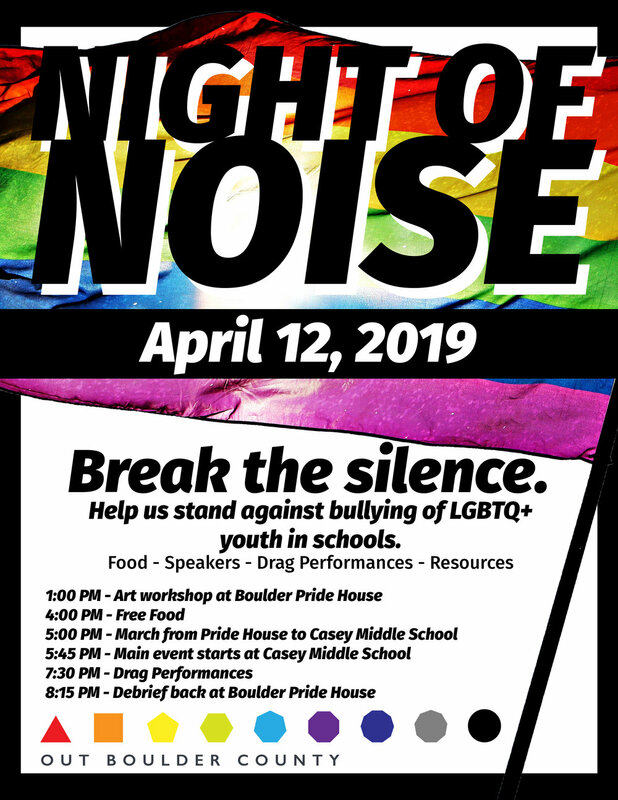 Drag Queens, Kings, and local community leaders will lead small groups of 10-15 youth to discuss the day of silence, the night of noise, and action opportunities for youth and their communities. We will have fantastic people in drag with fabulous performances! Have some desert with us and share your thoughts about the event with us!